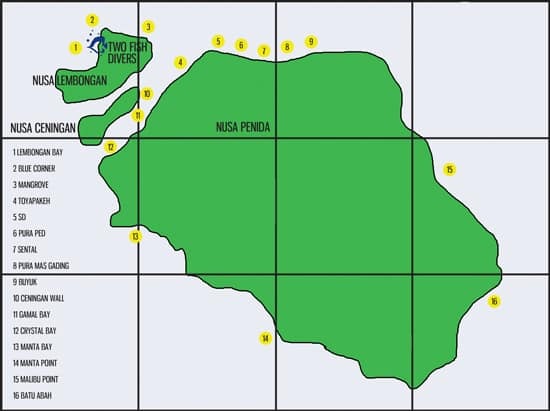 New dive sites are always being discovered around Nusa Lembongan, Nusa Ceningan and Nusa Penida. The sites that we currently visit on a regular basis are listed below. This is an exciting site for experienced divers only. The huge expanse of current-swept slopes at Blue Corner provides some dramatic topography. Dropping away to 50m, a series of overhanging terraces hide white tips and large black marbled rays and, as you approach the corner, schools of snapper and jacks regularly pass by. A great site for mola mola (ocean sunfish) during the season and other visitors include eagle rays, wobbegong, tuna and even the occasional shark. This site is so-called due to its location, right by the mangrove area to the north east Nusa Lembongan. Mangroves offer a healthy sloping coral reef, with small bommies and table corals waiting to be explored for the smaller stuff but often marble rays and other larger species swim past in the deeper water. Sharks are occasionally seen here too.  It’s a great site for all levels of diver. Lembongan Bay offers the perfect introduction to diving. Due to its maximum depth of 10m and calmer conditions, it is an ideal site for less experienced divers, those wanting a refresher or for avid photographers. The sandy bottom is dotted with coral bommies which are home to frog fish, moral eels, schools of silversides, unicornfish and many more of the smaller species. Sekolah Dasar means ‘primary school’, but when the currents are running, this site is not for beginners. Although less steep than Blue Corner it has large coral heads and currents that drift you past green and hawksbill turtles, marble rays, sea snakes, octopus, white tip reef sharks and the most diverse collection of corals and sponges in Bali. Not forgetting the resident school of batfish at SD that are almost always a certainty. Gamat Bay is a very small yet memorable site off Toyapakeh Strait. The steep, rugged reef slope is rich in hard and soft corals and is colourful down to more than 50m. Gamat is a dive where you don’t want to cover much territory and once you have navigated the slope, there are plenty of bommies, overhangs and small caves to explore as you head back into the shallows. Manta Bay is a shallow bay with a stunning backdrop. Being rich in plankton it attracts manta rays all year round. The dive has a maximum depth of 12m and the coral bottom, with its gullies and swim-throughs, is an interesting distraction from the manta action going on above. Similar to Manta Point, we cannot get to this site every day, but it is closer and more protected than Manta Point, so is fast becoming a very popular dive. The ‘jewel’ of Penida, Toyapakeh means salt water in Balinese and is the richest site in Penida. It is a divers’ favourite as you often find yourself swimming through school after school of colourful fish of every variety, including the red tooth triggerfish, giant trevallies and batfish. It has a steep wall to the south, terraces with huge hard coral formations in the bay and a shelving reef in the north that drops off gently all the way to 190m! The density of coral, sponge and fish life is incredible, even the infamous pygmy seahorse is occasionally spotted here. All this plus occasional larger pelagics such as hammerhead sharks, mantas and sunfish. This impressive coral wall begins at the foot of the sea cliffs to the north of Ceningan and drops down vertically to a depth of 180m. Currents can be strong here and this site is reserved for experienced divers only. The wall is colourful with dense collections of multi-coloured soft corals and sponges making it fun to explore with plenty of nudibranchs to find. Sweeping out into the current along the wall are inquisitive eagle rays which occasionally join the dive groups for the tour, which winds through schools of oriental sweetlips and sleek unicornfish. Also known as Penida Bay, the ‘Crystal’ in Crystal Bay refers to the fantastic visibility normally experienced here, which can reach over 40m on a good day. Crystal Bay is certainly one of the area’s most popular dive sites and is a favourite of the visiting mola mola (ocean sunfish) from August-October. The rock in the middle of the bay has very steep drop offs to the south and west and an amazing shelf in the north that is carpeted with wrinkled soft corals in the shallows. A healthy reef, an interesting cave, huge table coral and hundreds of fish of all shapes and sizes – there is not much that this dive site cannot offer! The site that made Penida famous! The plankton rich waters here attract the mantas all year round, sometimes seven or eight at a time, though even one is a fantastic sight. We rarely dive more than 15m deep at this site as along with the main attract of the mantas, turtles, nurse sharks, bamboo sharks and blue-spotted rays are regularly sighted at this depth, when the sea conditions are calm and favourable, it’s a dive to be savoured. These three sites are found side by side on Nusa Penida and share similar sloping reef topography. The colourful reef is made even more interesting with big, randomly placed barrel sponges and coral bommies. Schools of redtooth triggerfish, fusiliers, butterflyfish and drummers compete for passing food that rides the ocean currents. Turtles, rays, sea snakes and the occasional mola mola distract divers from the multitude of smaller creatures hiding amongst the corals, such as scorpionfish and frogfish.